IFT advised on the flooring aspects of the new £3.75m Asset Resource Centre for The Scottish Fire and Rescue Service (SFRS) in Dundee by Robertson Construction. We supplied and installed Premier Mortar Readymix screed bonded to substrate and mechanically prepared substrate and installed Flowfast Terroso system. The new facility was needed to meet the geographical and logistical demands of keeping SFRS’ northern fleet of HGV and light vehicles serviced to the highest possible standard. It will oversee the service and repair of 348 vehicles from across 164 stations across the north of Scotland, including Shetland, ensuring the SFRS can respond to emergencies whenever and wherever they arise. The project comprised the conversion of a 2,040sqm single-storey light industrial unit to create modern workshops and support facilities. 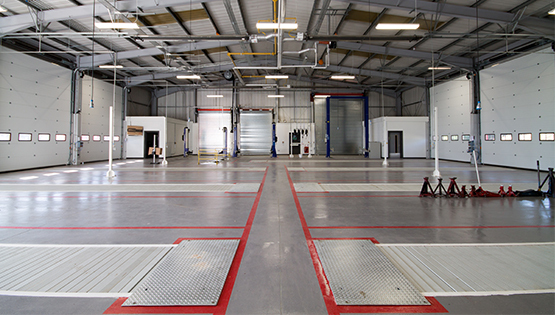 The workshop is fitted with seven vehicle inspection pits for fire engines, three hydraulic lifts for light vehicles, a mechanical parts store and ancillary rooms for remote works. Flowfast Decorative fast curing MMA Flake system was installed to the toilets and shower areas. 1,400sqm of Flowcoat SF41 high build epoxy coating including remedial works was installed to existing concrete slab to work shop floors, along with line marking and walkways.